There is nothing prettier than a Christmas tree with handmade ornaments. 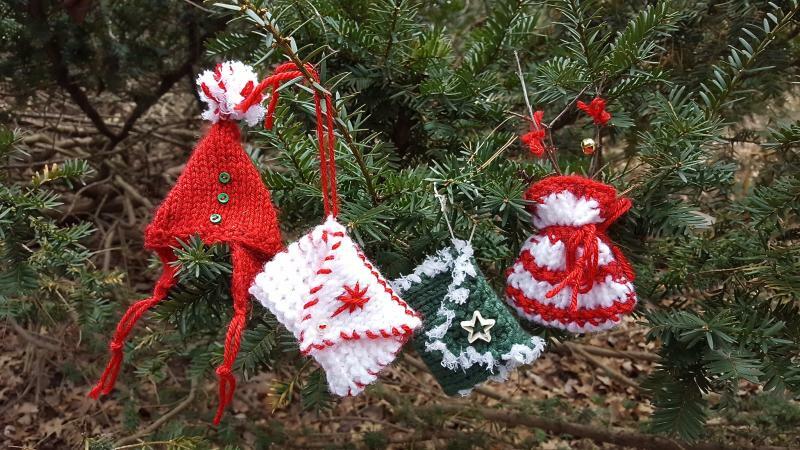 To make these, all you need are knitting needles, some yarn, and imagination to brighten the boughs. Ornaments take a bit of planning to knit and finish, but you are creating a miniature heirloom, so remember to start your knitting early in the year. 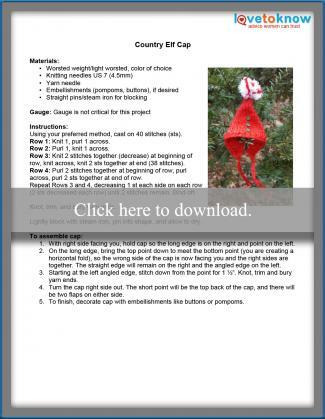 If you are a beginning knitter, allow yourself a day or two to study the pattern and make an ornament. Finishing, blocking, and embellishing also take time, so consider knitting a few pieces and then completing them together as a group. 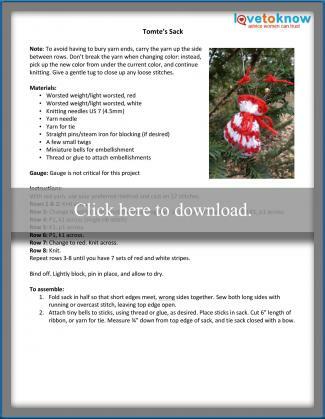 The following patterns are suitable for beginners: you need to know how to cast on, knit, purl, decrease, and bind off, and you can knit these ornaments on a long, winter's evening. Choose the pattern, then click on the pattern image to download and print the instructions. 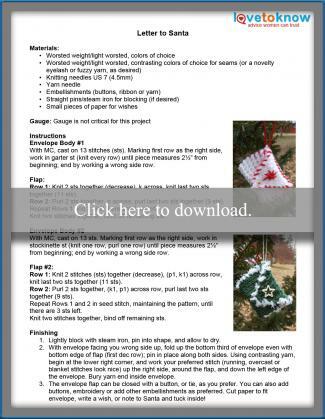 You can find additional help with downloading and printing the patterns by using this guide. Every elf deserves a warm holiday, and this hat will make the perfect gift for a magical friend. Finished size is approximately 2 1/2" x 3", but may vary with yarn used. If you want to let Santa know something special, why not knit a note and send it off to the North Pole? You can use these knitted envelopes to hold a note or even a tiny gift. Finished size is approximately 3" x 2", but may vary with yarn and stitches used. A tomte is a Scandinavian gnome who helps people. They are tiny creatures and appreciate a snack of milk or porridge on a cold winter's night. Good children receive presents from the tomte's sack at holiday time. Hang them from a Christmas tree or mantelpiece or display across a window on a "clothesline" with tiny clothespins (find these at craft shops). Decorate a wreath with knitted ornaments, or even an outdoor tree: both natural wool and manmade fiber yarns do well in bad weather. At the end of the season, allow the ornaments to dry flat on a folded towel and store carefully for next year. Use ornaments instead of bows when wrapping gifts: the recipient gets two treasures. Pile knitted ornaments into decorative bowls and let visitors choose an ornament as a farewell gift. In these busy days, knitting makes the holidays more personal. It warms the hearts of the person who knits, as well as the person who receives.